The most common DJ related question that I’m asked lately is: “What DJ rig are you using theses days?” The short answer is, “I’m using the Roland DJ-505 controller/drum machine with Serato DJ Pro.” Do I like it? Yes, I love it, although I could love it more if they had done one thing I’ll mention later. Having a stand alone drum machine attached to a DJ controller is right up my alley. Making said drum machine modeled after classic Roland drum machines and sounds that the whole world has danced to and is still dancing to drives it even further down my alley. Being able to sit and program beats without having to fire up my laptop is a pretty cool feature for a DJ controller. 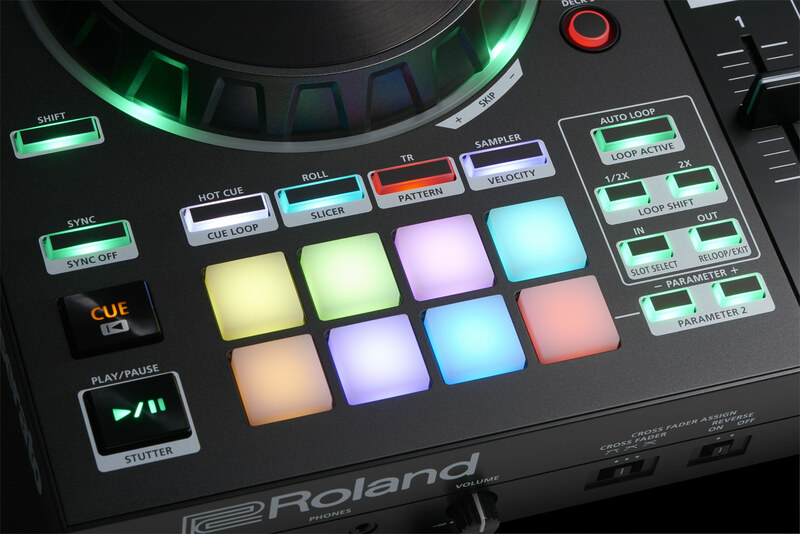 When it comes to drum machines, Roland the company is like an electronica god. How is Roland with DJ equipment? Well, they still have to battle with the behemoth company whose name shall not be spoken (Starts with a P and ends with R) as far as popularity, but I give Roland two thumbs all the way up on their DJ controllers. Roland has three DJ controllers: the DJ-202 (USD $299.99), DJ-505 (USD $599.99) and the DJ-808 (USD $1,299.99). While I’ve done gigs with both the DJ-505 and DJ-808, I haven’t yet used the DJ-202 so I can’t really give a hands on experience review of that unit. 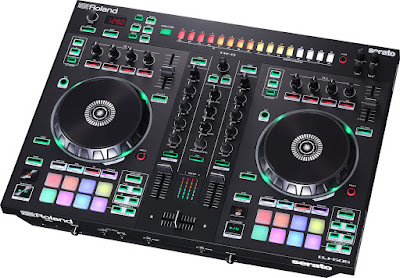 Although I haven’t used the Roland DJ-202, I would imagine that it works well enough for the average DJ that has no desire to get into production or live remixing. The first noticeable difference between the DJ-505 and the DJ-808 would be the channels; the 505 has two channels, while the 808 has four. If you include the separate dedicated channel for the drum machine, technically, the 808 has five channels and the 505 has three. While this additional channel is also used for master and booth volume on the 505, it is a great feature to make sure that your controller produced beats don’t overpower your live A cappella and beat layering efforts while performing. 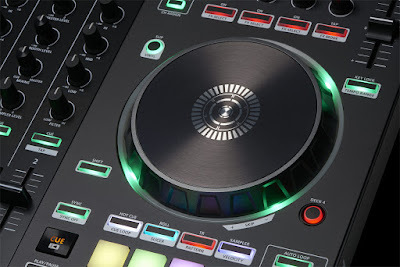 Speaking of performing, the eight touch-pads on each controller deck have sub-categories which include Hot Cue, Roll, TR, Sampler, Cue Loop, Slicer, Pattern, and Velocity. These functions allow you to do things like live tap drumming (think Future Man), accessing your pre-marked Serato cue points and executing pre-programmed drum rolls to add while live remixing as well as cutting and looping a breakbeat from a track on the fly. Both the decks and the onboard drum machine have an auto sync function, so if your beat matching isn’t exactly the cat’s meow yet, this fancy little button picks up the slack. Most buttons on the DJ-505 serve more than one function, so reading the manual is a good idea. This unit is still pretty new to me and I have yet to read the manual (do as I say, not as I do). I’ve just been doing gigs and discovering functions of the 505 as I work. Each controller deck has its own dedicated four pad FX section which gives you access to goo gobs of FX in your Serato program. In the center of the controller you have the ability to select and assign tracks to deck one or two without having to lean in and touch your laptop. With the 505, the selection tools are just four buttons and a knob, with each deck having it’s own “load” button, that enables you to navigate through both crates and song lists by artists or song name. Then you have your standard deck stuff like “key lock” and a button that allows you to switch back and forth between decks if you want to use a four deck setup within Serato. 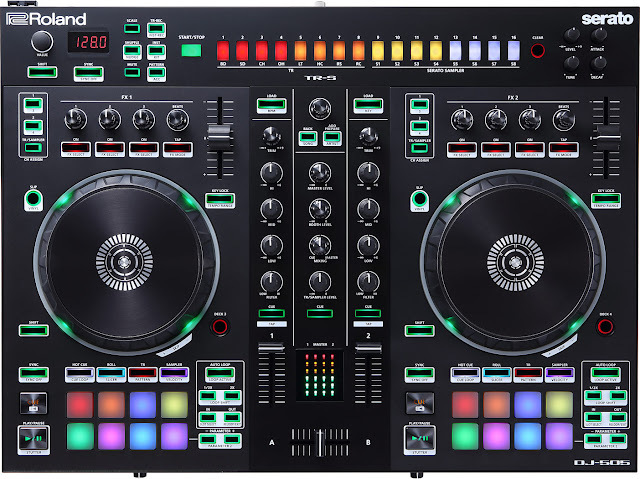 The only complaint I have that makes me love this unit 99 percent and not 100 percent is that there is no digital visual cue marker on the jog wheel like they have on the DJ-808. This is a standard feature on most CD decks and DJ controllers, so for Roland to not have this feature on their middle of the road controller was a bit of a shock and an Uber disappointment. If you never scratch while you DJ, then it’s not a big deal, but if you’re like me and like to torture your audience with a little bit of scratching every now and then, this is like boxing with one hand tied behind your back. Well, that’s my quick run through of my current weapon of choice at DJ gigs. Would I recommend this product to a friend? Absolutely.